Side Show tells the true story of conjoined twins who go from a freak show to vaudeville and try, unsuccessfully, to find love along the way. "We just did not get enough bodies and butts in seats that translate into word of mouth," says Side Show producer Darren Bagert. Above (from left): Ryan Silverman, Emily Padgett, Erin Davie and Matthew Hydzik. Joan Marcus / O+M Co. Early reviews of Wicked "missed the boat," says critic Jeremy Gerard. 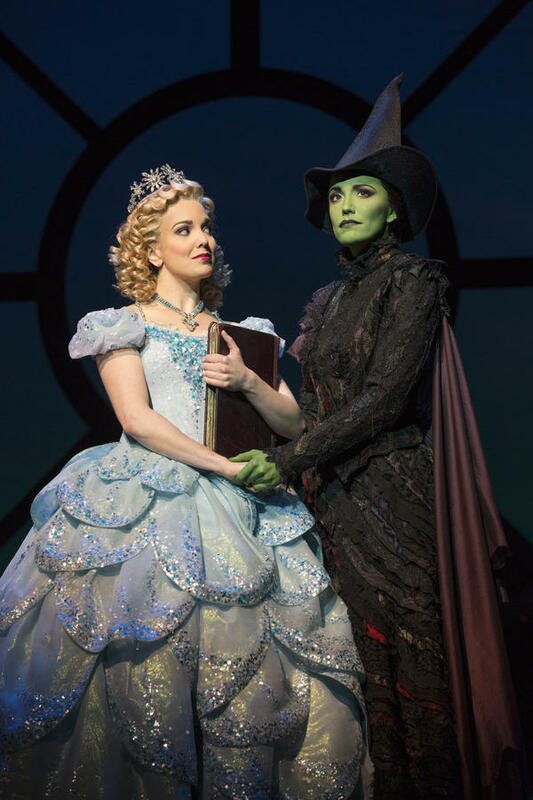 Above, Kara Lindsay (left) as Glinda and Caroline Bowman as Elphaba. Joan Marcus / Polk & Co.
Broadway is New York's biggest tourist attraction and brought in $1.3 billion in ticket sales last season. But it's also a high-stakes gamble for producers, since only 1 in 4 Broadway shows turns a profit. This month, two of the fall's most highly anticipated musicals, a revival of Side Show and The Last Ship, with songs by Sting, have thrown in the towel — closing, having lost almost their entire investments. Entertainment reporter and theater critic Jeremy Gerard of Deadline has been covering Broadway for decades. "If there's one thing I've learned in 30-odd years of covering this industry," he says, "it is this golden rule: You cannot make people see a show that they don't want to see." 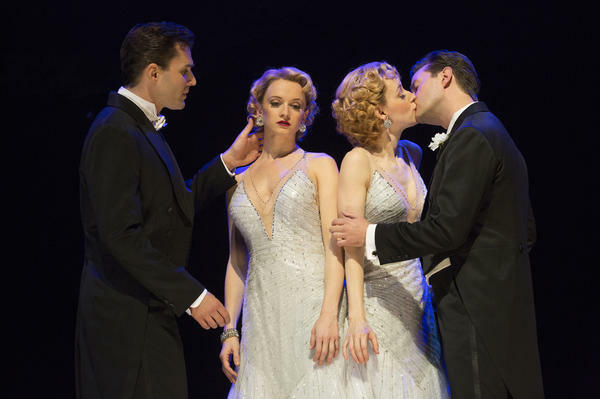 One of the shows they apparently didn't want to see was Side Show, an $8 million revival of a cult musical that bombed on Broadway in its original run in 1997. It tells the true story of Daisy and Violet Hilton, conjoined twins who go from a freak show to vaudeville and try, unsuccessfully, to find love along the way. Scott Mallalieu runs Great White Way, which sells tickets to schools, churches and other groups. He says even though he loved the show, he couldn't convince his clients to even try it: "Whether you call them co-joined or Siamese, you get the same reaction out of people immediately, which is, 'Why?' " he says. "They immediately say, 'No, I don't want to see that show.' "
The reviews were almost unanimously raves. And producer Darren Bagert says he did everything he could to attract audiences in the show's brief two-month run — including a splashy ad campaign and $35 tickets for people under age 30. But Side Show rarely brought in the $500,000 a week it cost to run. "We just did not get enough bodies and butts in seats that translate into word of mouth," he says. "We never did." And word of mouth is now even more important than reviews for a Broadway show, admits critic Jeremy Gerard. "Unless you come out of the theater saying 'I have to tell everybody I know they must see this show,' the show is going to die," he says. "It doesn't matter what The New York Times says, it doesn't matter what New York Magazine says. If they don't come out feeling that, it's not going to work." Critics are in a tough spot when it comes to shows that have some good qualities. "How do you tell somebody who's going to spend anywhere from $175 to $500 or more per ticket for a show, how do you tell them, 'It's so-so, but you can't miss this performance'?" Gerard asks. That creates a boom-or-bust environment on Broadway, says Bagert: "You're either a monster hit or you close quickly. There's no middle ground." So, producers try to hedge their bets, by bringing in stars for limited runs or doing adaptations of well-known movies. It's all about branding, says Ben Brantley, chief drama critic for The New York Times. And in the case of the $18 million musical The Last Ship, the brand was Sting. "But people don't clearly care so much about hearing what Sting has written, as actually seeing Sting in the flesh," Brantley explains. Sting was not in the cast of The Last Ship when it opened in October. Gerard thinks the problem wasn't the score, but the musical's story — an allegory about a prodigal son coming home to a depressed English industrial town. "The critics said terrific things about the music, but the story was really kind of ponderous and not very believable, and so people had the same problem with that," says Gerard. In something of a Hail Mary, the producers actually put Sting in the show, in a supporting role, and that gave The Last Ship a brief bump in sales. There's another golden rule on Broadway, says Gerard: You can't stop people from seeing a show they want to see, despite the critics. Ten years ago, when Wicked opened, most of the major critics gave it mixed to negative reviews. "We as critics missed the boat on that one," he admits. "The audience didn't care!" And just like its hit song, Wicked has been "Popular" — on Broadway and around the world — ever since. This coming weekend, one of the most anticipated musicals of the Broadway season will close. "The Last Ship," with songs by Sting, is the second high-profile production to throw in the towel. The other was a revival of "Sideshow." Both musicals lost almost their entire investment. There is, of course, lots of money to be made on Broadway. Last season it brought in $1.3 billion dollars in ticket sales. But as NPR's Jeff Lunden reports, only 1 in 4 Broadway shows turns a profit. JEFF LUNDEN, BYLINE: Jeremy Gerard of deadline.com has been covering Broadway as an entertainment reporter and theater critic for decades. JEREMY GERARD: If there's one thing I've learned in 30 odd years of covering this industry, it is this golden rule - you cannot make people see a show that they don't want to see. LUNDEN: One of the shows they apparently didn't want to see was "Sideshow," an $8 million revival of a cult musical which bombed on Broadway in its original run in 1997. ERIN DAVIE: (As Violet Hilton, singing) Like a fish plucked from the ocean tossed into a foreign stream. LUNDEN: It tells the true story of Daisy and Violet Hilton, conjoined twins who go from a freak show to vaudeville and try unsuccessfully to find love along the way. DAVIE: (As Violet Hilton, singing) Who will love me as I am? LUNDEN: Scott Mallalieu runs greatwhiteway.com, which sells tickets to groups - school groups, church groups. He says even though he loved the show, he couldn't convince his clients to even try it. SCOTT MALLALIEU: Whether you call them co-joined or Siamese, you get the same reaction out of people immediately, which is, why? And they immediately say, no, I don't want to go see that show. LUNDEN: The reviews were almost unanimously raves, and producer Darren Bagert says he did everything he could to attract audiences in the show's brief two-month run - a splashy ad campaign, $35 tickets for people under 30. But "Sideshow" rarely brought in the $500,000 a week it cost to run. DARREN BAGERT: We just did not get enough bodies and butts in seats that translate into word-of-mouth. We never did. LUNDEN: And word-of-mouth is now even more important than reviews for a Broadway show, admits critic Jeremy Gerard. GERARD: Unless you come out of the theater saying, I have to tell everybody I know they must see this show, the show is going to die. It doesn't matter what The New York Times says. It doesn't matter what New York magazine says. If they don't come out feeling that, it's not going to work. LUNDEN: Critics are in a tough spot when it comes to shows that have some good qualities. GERARD: How do you tell somebody who's going to spend anywhere from $175 to $500 or more per ticket for a show, how do you tell them it's so-so, but you can't miss this performance? I'm a consumer. I say, what? LUNDEN: That creates a boom-or-bust environment on Broadway, says producer Darren Bagert. BAGERT: You're either a monster hit or you close quickly. There's no middle ground. LUNDEN: So producers try to hedge their bets by bringing in stars for limited runs or doing adaptations of well-known movies. It's all about branding, says Ben Brantley, chief drama critic for The New York Times. And in the case of the $18 million musical, "The Last Ship," the brand was Sting. BEN BRANTLEY: But people don't clearly care so much about hearing what Sting has written as actually seeing Sting in the flesh. LUNDEN: Sting was not in the cast of "The Last Ship" when it opened in October. Jeremy Gerard thinks the problem wasn't the score, but the musical story - an allegory about a prodigal son coming home to a depressed English industrial town. GERARD: The critics said terrific things about the music, but the story was really kind of ponderous and not very believable, and so people had the same problem with that. LUNDEN: In something of a Hail Mary, the producers actually put Sting in the show in a supporting role, and that gave "The Last Ship" a brief bump in sales. STING: (As character, singing) Through the teeth of this tempest, in the mouth of a gale, may the angels protect me if all else should fail and the last ship sails. LUNDEN: There's another golden rule on Broadway, says Jeremy Gerard - you can't stop people from seeing a show they want to see despite the critics. Ten years ago, "Wicked" opened to almost unanimous pans. GERARD: We, as critics, missed the boat on that one. The audience didn't care. KRISTIN CHENOWETH: (As Glinda, singing) Popular. You're going to be popular. LUNDEN: It's been popular on Broadway and around the world ever since. For NPR News, I'm Jeff Lunden in New York. Transcript provided by NPR, Copyright NPR.